Memories of Fiction: An Oral History | This AHRC-funded project aims to find out how reading shapes our lives. The Memories of Fiction project came to an end of its funded period this summer, so it seems time to reflect on some of its highlights, and to look forward to what’s next. One of the most delightful aspects of the project was the participation of many others beyond the project team, without whom it could not have taken shape in the ways it has. We want to thank again the seven reading groups who welcomed and talked to us (at Balham, Battersea, Putney, and Roehampton libraries), and especially all those who took part in the interviews. The archive provides a wonderful wealth of reflections on reading and we are sure will continue to be of interest in years to come. We are also very grateful to the advisory group, who contributed to the project throughout. Martyn Lyons kicked off with a seminar about the Australian Readers Remember project and ‘why we (still) need need an oral history of reading’, which provided an ideal launch. Other excellent talks were given by Shafquat Towheed, Gill Partington, and Alison Waller (podcasts here), and also at the conference organised jointly by the Oral History Society and Memories of Fiction, ‘Beyond Text in the Digital Age?’, by Mary Grover and her Reading Sheffield team. The librarians and book group facilitators Ferelith Hordon and Alison Barton also contributed brilliantly to talks about memories of children’s books, and libraries, at Putney and Balham libraries, as well as being interviewed for the project. We are continuing to work on publications. As well as individual articles, our proposal was accepted for a Themed Section of Participations: Journal of Audience and Reception Studies, to consist of approximately 8-10 articles about using interviews to investigate reading, which will be out next Spring. Literary scholars, and historians of books and reading are increasingly using oral history and other kinds of interviews, and having received many excellent proposals in response to the Call for Papers, we are optimistic that this issue of Participations will be a valuable resource for considering the methodologies of interviewing and its great potential for research in the field. As well as informing the project’s talks and publications, the interviews provided the basis for the theatre production, The Living Library. This wonderful production, at London’s Omnibus Theatre in May 2018, consisted of a series of sound installations, dance, storytelling, and audience participation events. For each showing, the library first opened to allow audience members to browse the sound installations. These included a collection of children’s books, including those by Enid Blyton (most often remembered by the people we interviewed), which when opened played extracts of readers’ memories of those books. At another installation headphones allowed audience members to listen to people talking about the importance of libraries in their lives, while browsing library catalogue cards and using a library stamp to mark the titles they remembered reading. After around twenty minutes browsing in that Living Library area, the audience was ushered through to the theatre space, where, first, a dancer enacted relationships with books (such as escaping through reading) to the sound of interview monologues that gradually turned into music. It was moving to hear two stories in particular, that testified to the power of reading, in one case making it possible to survive difficult times. Finally, moving on from the individual relationships with books, the audience gathered in groups to ask each other questions (provided as prompts) over tea and biscuits, recalling reading groups and the interview situation itself. The project’s research informed the production through the interviews, and also through key themes, including the importance of reading and libraries in peoples’ lives (also reflected for example in a post for the Libraries Taskforce), how reading is remembered, and how reading is a social as well as a private activity. 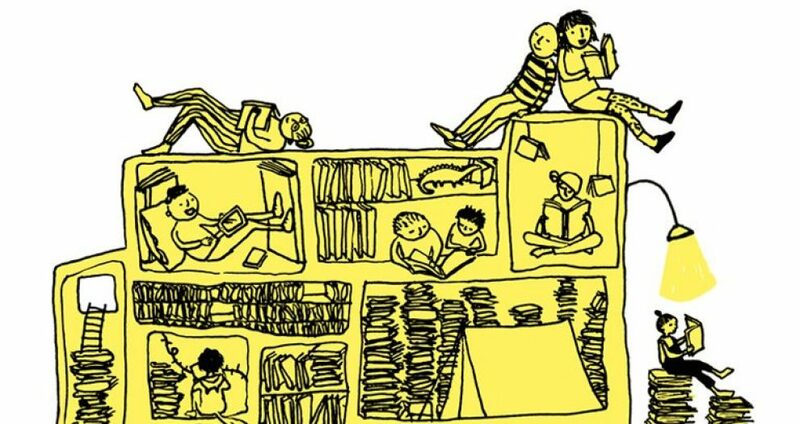 I am now submitting a funding bid to the AHRC for a follow-on project, ‘Living Libraries’. If the project is funded, it will create oral histories at five libraries across England, archived by National Life Stories at the British Library; further Living Library installations and performances; and an audio documentary aimed at BBC radio. One of the main aims of the project is to increase public awareness of the value of libraries and to improve understanding of recent changes in library provision. So I am pleased to report that Memories of Fiction is continuing in various forms, including publications and hopefully ‘Living Libraries’. In preparing for The Living Library, I’ve spent months reading transcripts and listening to interviews with people talking about how reading has shaped their lives. It feels like a real privilege actually to hear how profoundly books and libraries have helped different people. “Reading literally saved my life” sounds like exaggeration; to hear it said in earnest is quite a thing. I am struck again by how powerful reading is, how lucky I am to have the opportunity to read. As a self-confessed bookworm and through my work as a Creative Associate for The National Centre for Children’s Books (Seven Stories), I know the benefits of reading for pleasure. Yet, as the interviews highlight, it can be difficult find time for reading. I certainly don’t read as much as I did when I was younger. An unexpected boon for me working on this show is that it’s given me a reason to read again. It’s like being fed something for which I didn’t realise I was even hungry. Books that have awakened and informed me, books that have charmed and impressed me, books I’ve rediscovered I once loved in forgotten times and places. I hoped that through the show, we would inspire people to reconnect with books. I didn’t realise it would be me! Maybe, it will be you too. Do you have time for story time? Yesterday was the first day of rehearsals for ‘The Living Library’ performance, celebrating the research from the ‘Memories of Fiction’ project. This point in process is always exciting, and a bit scary: knowing that in 3-4 weeks time, all these people will be coming to be entertained and moved and interested in something that right now doesn’t exist, won’t exist fully until it is (a)’live’ on the night. In rehearsals, my pleasure is watching fragments emerging, slowly fitting them together to a coherent story. It was lovely to see the words from interviews months past, talking about memories years or decades past, coming alive now as images and actions created by our dancer, Patricia Suarez. I look forward to posting more as our rehearsals progess. Until then…. Here are some photographs from our day. A key publication arising from the Memories of Fiction project is to be a Themed Section of the journal Participations: Journal of Audience and Reception Studies. We are seeking proposals for articles to contribute to this collection. This themed section of approximately ten articles will bring together recent and current work which uses interviews to investigate reading (including books, newspapers, and comics, in social and individual contexts). It will bring together a series of investigations which foreground readers’ narratives. Since the turn to ‘the reader’ in literary theory and criticism in the 1970s, scholars have increasingly used interviews to engage with the narrated experiences and memories of ‘actual’ readers. Janice Radway’s Reading the Romance (1984) was among the first studies to use interviews to undertake an ethnographic investigation into romance reading in a Midwestern US town. Around fifteen years later Jonathan Rose reused oral history interviews from the ‘Edwardians’ project (carried out in the UK in the 1970s), along with life writing, in his research into autodidactic reading for The Intellectual Life of the British Working Classes (2001). In more recent projects, including ‘Scottish Readers Remember’ (2006-9), ‘Reading Sheffield’ (2010 ongoing), and ‘Memories of Fiction’ (2014 ongoing), collecting oral histories has grown in importance as a way of researching readers and reading. In their use of interviews and engagement with ‘everyday’ readers, researchers of reading have participated in the wider use of interviews across reception studies, in many cases as part of an ethnographic approach to audiences, including viewers, listeners, and cinemagoers. Yet the significance of interviews in the study of reading – and indeed more widely in reception and audience studies – is rarely discussed, a gap which this themed section of Participations will address. I’m delighted to announce our next event to take place this coming May: We’re going to take over the Omnibus Theatre building in Clapham, with a ‘library’ of varied performance spaces, all relating to how vitally libraries and reading shape our lives. The material will come from the oral histories created with reading group members about what they remembered and valued about reading. One of the key emerging themes was the importance of libraries as unique cultural and social spaces, offering ‘comfort, discovery, self-definition and salvation’. So to get the messages out there, we’re going to use the text and audio material as the basis for all the pieces, all in different forms, to give people a variety of theatre experiences (storytelling, monologues, video pieces, etc), just like books with different genres. It’s being produced by an experienced and inspiring producer and director, Laura Bridges, and will be part of the theatre’s storytelling festival. As an old library, the Omnibus Theatre is the perfect space for it! More information will become available as the project develops, but for now if you’re interested please take a note in your diaries: 9-12 May 2018.